Titanium nitride coating is an extremely hard, inert, thin film coating that is applied primarily to precision metal parts. Titanium Nitride (TiN) is the most common PVD hard coating in use today. TiN has an ideal combination of hardness, toughness, adhesion and inertness. Titanium nitride is a metallic nitride compound having a chemical formula of TiN. It is a solid material exhibiting a light metallic gold color and having no odor. In solid form as a thin coating it is non-volatile and non-flammable, and is insoluble in organic solvents. It is only slightly reactive with strong inorganic acids and will react with and dissolve in strong oxidizing agents (hydrogen peroxide and per sulfates). It is hard, highly resistant to abrasive wear and as such does not release wear debris. When deposited as a titanium nitride coating, TiN is fully dense and void-free, and as such will not absorb or trap any powdered or liquid materials that it may come into contact with. Although most of their applications recent, the refractory nitrides have been known for over one hundred years. Titanium carbonitride was first described in 1822 and was identified by chemical analysis in 1850. This was the result of extensive studies of steel and steel components, where these compounds form spontaneously. The element nitrogen forms compounds with most other elements, but by convention, the term nitride is only applied to those compounds formed by nitrogen and other elements of lower or about equal electro negativity. There are three general and interrelated atomic characteristics that play an essential role in the formation of nitrides – the difference of electro negativity between nitrogen and the other element, the size of the respective atoms and the bonding characteristics of these atoms. As a rule of thumb, nitrogen has higher electro negativity that any other elements to their left, when looking in the periodic table of elements. Regarding atom size, it should be noted that nitrogen is one of the smallest atoms, though it should also be kept in mind that the size of the atom is related to a wave function, so, technically, no atom has a precise radius. At last, but the most important for the formation of titanium nitrides, is the nature of the bond between the nitrogen atom and the titanium atom in the compound. A bond is the force of attraction that holds together the atoms of a molecule or a crystal. It is characterized by two factors – its length and its strength. Generally, short bonds are stronger than long bonds. There are several possible bonds. Large differences in electro negativity favor ionic bonding, formed by transfer of valence electrons between two different atoms. The covalent bonds are formed by sharing of electrons, rather than transferring them. The metallic bond, the electrons are delocalized, essentially they are able to move essentially free throughout the structure. The bonding occurs by electrostatic attraction between the electrons and the positive metal ions. Most metals can be considered as close-packed arrays of atoms held together by these delocalized electrons. In titanium nitrides, the difference of electro negativity is large, and the nitrogen atom is much smaller than the titanium atoms. This allows nitrogen to nest in the interstices of titanium lattice. The bond is partly covalent and ionic, but mostly metallic – which explains why the final product closely resembles metals. The most common methods of TiN thin film creation are physical vapor deposition chemical vapor deposition (CVD) – which are both methods also used to create other titanium coatings – such as certain black titanium alloys. In both methods, pure titanium is sublimated and reacted with nitrogen in a high-energy, vacuum environment. Other methods involve using titanium powder metallurgy technologies to fabricate precursor products, compressing them to the proper density, and then igniting in an atmosphere of pure nitrogen. Remember, titanium is one of the few elements that burn in a pure nitrogen atmosphere. The heat released by the chemical reaction between the metal and gas is sufficient to sinter the nitride reaction product into a hard, finished item. 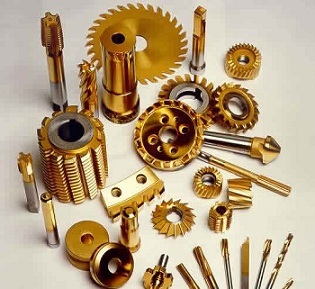 Although titanium nitride coating is usually used in mass-oriented industrial products, there are smaller operators that apply titanium coating for orders as low as five or ten units. As far as I know, due to the high technical requirements there is no possibility of applying a decent titanium nitride coating by using improvised methods.